From Hakodate, head north on the Hokkaido Expressway. At Kuromatsunai JCT, turn left onto the Kuromatsunai Shindo road. The following 6km section of road is toll-free. On reaching Route 5 turn right and then follow Route 5 through to the Niseko and Kutchan region. This route is about 180km and in normal conditions will take around two and a half hours. People who have the Niseko All-Mountain Hourly Pass or Day Pass can use this shuttle bus free of charge. The shuttle bus stops at all of the main ski resorts as well as Kutchan Station, Niseko Station, some major hotels. There are also several bus stops throughout the Hirafu Village area. More information on the shuttle bus on the Niseko - By public transport section. Below are general directions from Route 5 close by Kutchan Station in the central area of the town to each resort. Note that Kutchan Station may not be the closest train station to the resort. 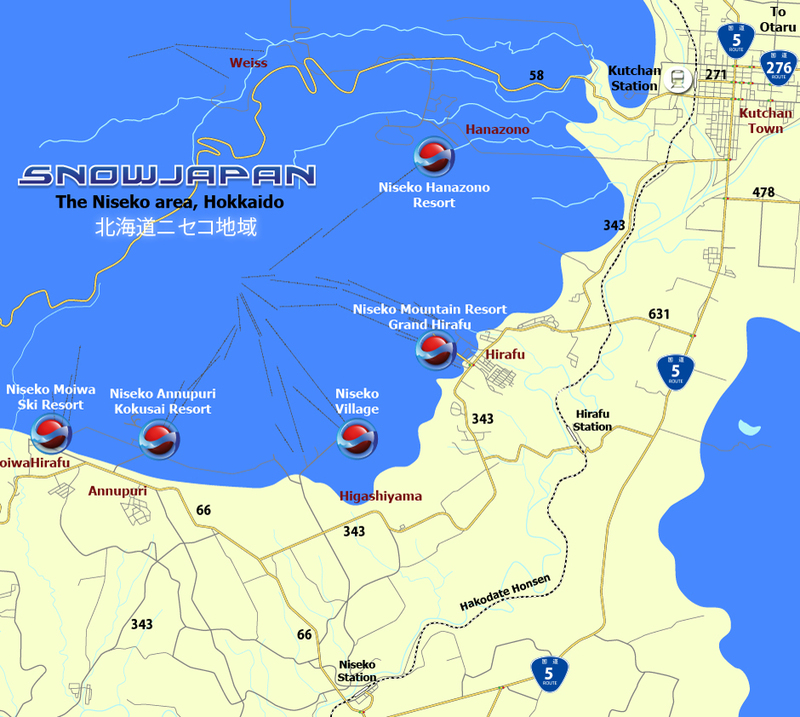 More detailed information on how to get to Niseko by public transport can be found here. 旭ヶ丘 about 1.5km The small Asahigaoka ski hill is located just behind Kutchan Station, less than 1.5km away. From Route 5 just to the south of Kutchan Station, turn onto Prefecture Road 58 and after just over 1km turn right. The ski hill is just on the left side down this road. turn right onto Prefecture Road 343 and follow the road until traffic lights about 5km further on, then turn right to head into Hirafu. Or, continue a bit further on Route 5 and turn right onto Prefecture Road 631 and then continue on Prefecture Road 343 to head up to Hirafu. Continue through the Hirafu area and also past the Niseko Village turn off, until reaching a junction after about 7km. Turn right here onto Prefecture Road 66 and continue for just under 3km until reaching the turn off for Niseko Annupuri. Turn right to head up to the resort base. about 6km Heading south from Kutchan Station on Route 5, turn right onto Prefecture Road 343. Follow this road and after about 2.5km turn right onto the road is signposted as Hanazono. At the end of the road turn left for the resort base and car park. turn right onto Prefecture Road 343 and follow the road until traffic lights about 5km further on, then turn right to head into Hirafu. Or, continue a bit further on Route 5 and turn right onto Prefecture Road 631 and then continue on Prefecture Road 343 to head up to Hirafu. Continue through the Hirafu area and also past the Niseko Village turn off, until reaching a junction after about 7km. Turn right here onto Prefecture Road 66 and continue for just under 3.5km until reaching the turn off to Niseko Moiwa. Follow this road to the resort base. turn right onto Prefecture Road 343 and follow the road until traffic lights about 5km further on, then turn right to head into Hirafu. Or, continue a bit further on Route 5 and turn right onto Prefecture Road 631 and then continue on Prefecture Road 343 to head up to Hirafu. turn right onto Prefecture Road 343 and follow the road until traffic lights about 5km further on, then turn right to head into Hirafu. Or, continue a bit further on Route 5 and turn right onto Prefecture Road 631 and then continue on Prefecture Road 343 to head up to Hirafu. Continue through the Hirafu area on Prefecture Road 343 for a further 6km. At the traffic lights turn right to head up to Niseko Village. Rusutsu is essentially on the opposite of Mt Yotei from Niseko. 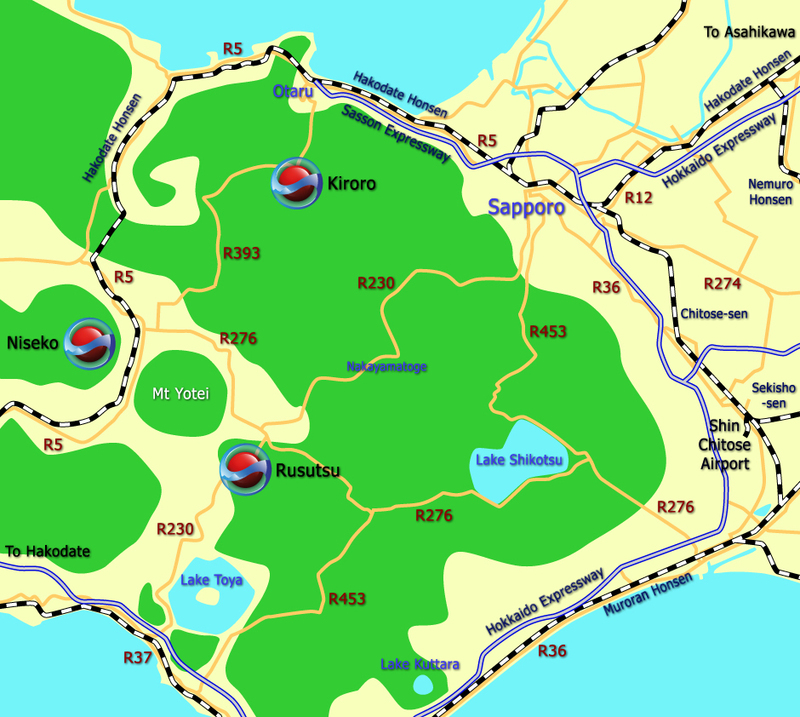 From the central Kutchan area, take Route 276 in an easterly direction and to the north of Mt Yotei, and then onto Route 230 to head into Rusutsu. about 28km To get to Rustusu by going round to the south of Mt Yotei, take Route 5 in a southerly direction and then turn left onto Prefecture Road 66. Follow Prefecture Road 66 until reaching Route 230 in Rusutsu. Turn left to head towards Rusutsu resort. From Kutchan town take Route 276 eastwards and then soon onto Route 393 signposted as Akaigawa. Follow this road for about 38km until reaching the turn off and signs for Kiroro. Turn right here and head up towards the base of Kiroro. From Kutchan town head towards the Asari IC of the Sasson Expressway using Route 276 and Route 393. Get onto the expressway and at Sapporo JCT change over to the Hokkaido Expressway to head north towards Asahikawa. For more details on getting to Furano, please refer to the below guides. For detailed information on how to get to Niseko by train and public transport, please go to this section.